Just two weeks ago Claud suffered gastroenteritis and it was the worst experience for me. Just before learning of her diagnosis, my mind was going crazy thinking if she had food poisoning or if she has “bulate.” I was praying so hard and at the same feeling guilty that I couldn’t control what was happening. With every vomit and trip to the bathroom, my heart was breaking into pieces. My beckon of hope was that she wasn’t feeling or looking weak at all. This got me thinking that now that she’s 4 and goes to school, I can’t control what she comes in contact with. That even at home, any of us can get prone to illnesses. Especially with worms, which I learned aren’t always brought on by poor hygiene. ANYONE can get worms. Did you know that worms can be passed on from one family member to another? 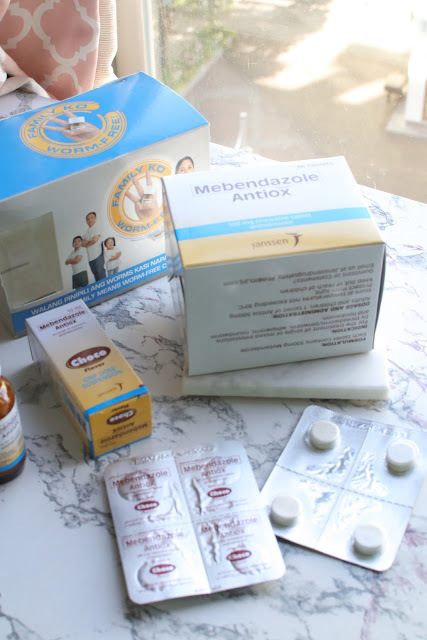 Good thing I came to know Antiox (Mebendazole), they taught me about deworming and the necessary steps I can take to prevent worms from infesting our household. That the stigma of it can be cured by being well-informed about de-worming. That should one family be infected with bulate, everyone should medicate as well. We know that taking medicines isn’t always the best first steps. But for worms, it is. No longer you let this pass, the more worms can mutate and you will definitely risk your family’s health. And the worst is, impose major and long-term health risk to the family. It stunts growth, affect mental performance. reason for malnutrition and causes for children to be less active. So heed this advise, take this health warming seriously. This is the reason I took on writing about this! I realized that if Claud had worms, my newborn would be prone to having it also. Can you imagine a 7 moth old child suffering from this kind of problem? I don’t think I would have handled it well. Worms are incredibly easily spread among youngsters when they’re engaging in team sports, playing outdoors or even touching school equipment that another infected youngster might have previously used. But as easy as worm infections are to contract, they’re also easy to treat. My child has worms, what should I do? Treat the infection as early as possible and don’t forget to treat yourself and the whole family. Treating just one member of the family for their worm infection and neglecting to treat the others may allow for re-infestation as worms are highly contagious. If you spot the signs and symptoms of a worm infection in one family member, be sure to act fast and treat everyone living in the house – including Mom and Dad! If my child has worms, do I need to keep them home from school? It is not usually necessary for people with worms to stay home from school, childcare or work. However, if your child has loose bowel motions, you should keep them home for 24 hours until the diarrhea has stopped. If your child attends a childcare center or preschool, you should inform staff so that steps can be taken to prevent infection spreading (e.g. cleaning toys and equipment) and encouraging children to wash their hands regularly. How do I avoid animal-sourced worm infestations? 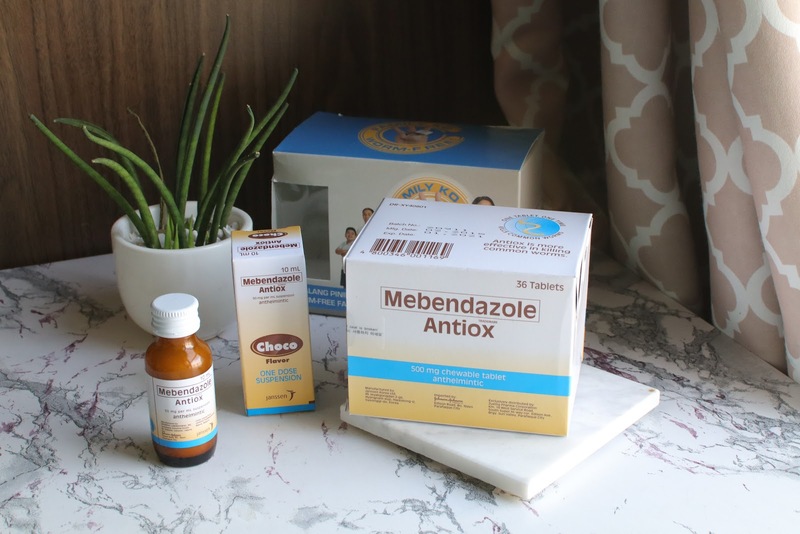 Does Mebendazole (AntioxTM) protect against future infections? Deworming products work only on the adult worms present in the intestine at the time the medicine is taken. This is why it is so important to give your home a thorough clean after treatment, to kill any remaining eggs and help prevent re-infestation. Mebendazole (Antiox™) should be used as a treatment rather than a preventative option. There are ways in which you can reduce the risk of or prevent re-infestation (such as regular hand-washing, clean bed linens, steering clear of animal feces, etc) but the medication should only be used for the treatment of an existing infection. Are worms infections the result of poor hygiene? While it’s true that poor hygiene habits can contribute to the spread of a threadworm infection once you have contracted it, actually catching the infection can be as simple as touching an infected surface - it doesn't matter how clean you are. Catching threadworms does not mean a person is ‘dirty’. Threadworm infections are highly contagious, and infection can occur no matter how clean a person is, or how much care is taken to avoid it. Is it true that worms come out of mouth, ears, nose after deworming? Mebendazole works by preventing worms from absorbing sugars which they need to survive. This action cases the worms to die. After treatment with Mebendazole (Antiox) for mild to moderate worm infection, worms will not migrate to other parts of the body. How soon do worms come out after taking Antiox? After taking Antiox, worms are killed within few days. Worms are expelled in the faeces. Worms do not come out alive. How do I take Mebendazole (Antiox) and what does single dose mean? Antiox can be given as a single dose of 500 mg. Single dose of either 500 mg tablet or the whole 10mL of the 50mg/mL Antiox oral suspension. As a mother, I can’t help but feel helpless when my family get sick. That’s why I choose to be proactive in preventing this. 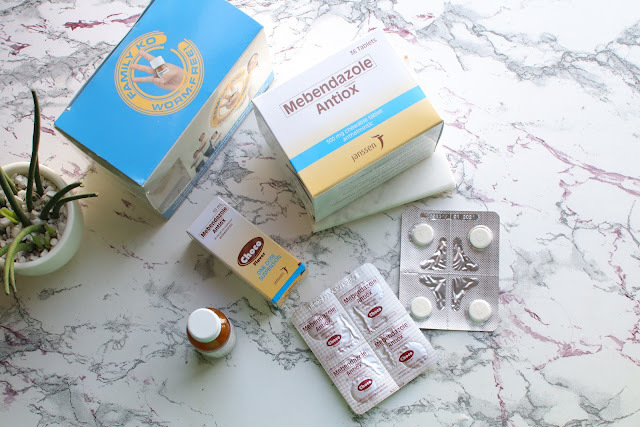 I know I can’t control everything my family comes in contact with and most likely, I can never control what they do outside, but the least I can is ensure my household is well-kept and that I can easily fight worms with Antiox. So here are key steps you can do to prevent worms and kill worms in your household. Scheduled cleaning of the household. Pet gets groomed on good steady schedule. Pets should also be dewormed as well. Sterilize utensils or better yet, use UV sterilizer. Make sure to keep Antiox in stock at home. The most important thing is to NOT BE AFRAID or ASHAMED. The moment signs of illness appear, go to your doctor. Should worms be the reason for the illness, take the necessary steps I mentioned above. Heres to worm-free household, mommies!